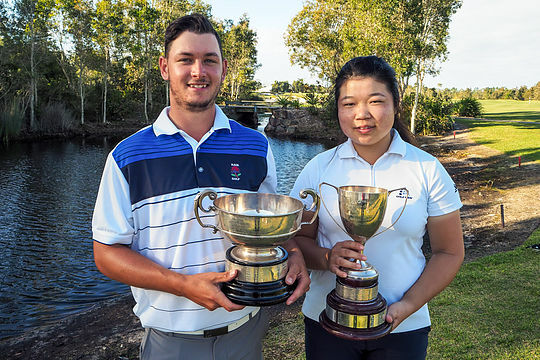 Dylan Perry and Celina Yuan have taken out the Queensland Amateur titles following some stellar finals action at Pacific Harbour in Brisbane’s north-east. Perry remained in form all week eliminating the 5th, 8th, and 16th top seeds after already taking out the prestigious Queensland Men’s Stroke Play Championship title on Tuesday. Perry accounted for number 3 seed Douglas Klein with a thrilling 3&1victory after making his move early in the final where he was 3-up through seven holes. Subsequent birdies during the early stages of the back nine had Perry keeping his 3-up advantage through the 14th, but then a birdie putt from Klein altered the match to 2-up with three to play. It would prove a little too late for Klein with Perry wrapping up the match on the 17th for a classic win by collecting both the Queensland stroke and matchplay titles. Perry becomes the 5th New South Welshman to win the Queensland Amateur Championship in the past seven years and the first player to win back-to-back Queensland Stroke Play and Amateur titles since Daniel Nisbet in 2009, and Queenslander Jason Day in 2006. The Queensland State titles add to Perry’s victory at the 2015 NSW Country Championship and come on the back of a string of top-10 finishes including the Lake Macquarie Amateur, Australian Amateur medal and the Federal Amateur. With his win Perry earns a start in the 2016 Isuzu Queensland Open to be held at Brisbane Golf Club in October. He’ll be one of several amateurs in the field including US Junior Champion, Min Woo Lee. In the women’s final number 2 seed Celina Yuan outlasted Brittney Dryland to win on the 19th in another classic final encounter. Dryland held a 1-up advantage early until Yuan sunk a massive putt on the 5th to square the match. Dryland took control back on the 8th hole and continued to the 11th to have a 2-up lead. Yuan then sunk a birdie putt on the 16th for a win to continue the match but when Dryland was unable to capitalise with a win on the 17th after having a putt for the championship she gave Yuan a lifeline. The 18th saw Drylands in all sorts of trouble after she found the water twice leading to a loss of the hole and the final moving to sudden death extra holes with the players again going down the 18th. Yuan then holed a eight metre putt for 1-up victory to claim the 2016 Women’s Amateur title in a remarkable comeback for the former Australian Girl’s champion. Yuan certainly rises to the occasion in playoffs with her Australian Girl’s title coming her way back in 2015 following a three extra hole playoff against Karis Davidson.